Don't let directions impede an adventure. Finding Your Way Without a Map or Compass ($7). Wandawega Sureshot Slingshot ($15). Sperry Top-Sider A/O 7-Eye Boot ($70). River Island Jersey Sleeve Denim Jacket ($82). Levi's Vintage Pocket T-Shirt ($90). Brixton Saint Beanie ($28). Carhartt WIP Johnson Pant ($118). Olympus PEN E-P1 12 MP Digital Camera ($690). A clean slate for a new year. Post Overalls Melton Cruzer Jacket ($572). Gant Lambswool Cable Shawl Cardigan ($113). Brooks Brothers Poplin Navy Large Gingham Sport Shirt ($65). Paul Smith London Westborne Trousers ($207). Apolis Co-op Alpaca Scarf ($98). Coach Basic Nappa Gloves ($128). Adam Derrick To Boot New York Brennan Boots ($450). Junghans Max Bill Chronograph ($2,420). Postalco One Year Wall Calendar ($14). Welcome the new year in the right way. Gucci Black Brera Slim-fit Suit ($1,700). Brooks Brothers Button Down Oxford Shirt ($166). Brooks Brothers Tuxedo Neck Tie ($69). Loro Piana Grande Unita Cashmere Scarf ($425). The Tie Bar Pocket Square ($8). Armand de Brignac Brut Gold (Ace of Spades) Champagne ($299). Jack Erwin Ike Boot ($210). Metrokane Velvet Champagne Pliers ($20). Coach Box Grain Leather Belt ($128). Design Pulse Beach Clay Hair Mud ($24). It's flu season — drown your symptoms in the sweet sound of Sonos. Sonos PLAY:1 Wireless Speaker ($199). Me Undies French Terry Sweatpant ($60). Home Alone Mix and Match Sweater ($123). Alexander McQueen Socks ($80). Outlier Long Watch Cap ($65). Calendar Island Day Blanket ($278). BOTOT Mouthwash Concentrate ($22). Ugg Ascot Slippers ($100). Chapstick Moisturizer ($2). Blind Barber Watermint Gin Facial Cleanser ($18). This edition of Garb is sponsored by our friends at Sonos. Prepare your next proposal in style. Warby Parker Durand Glasses ($95). Warby Parker Nash Glasses ($95). Pine Drafting Table ($695). Gant Rugger Oxford Shirt ($135). Naked and Famous Weird Guy Jeans ($135). Universal Works Nylon Quilt Vest ($198). Heavy Duty Pencil Compass ($22). Leather Blueprint Case ($194). Delfonics Roll Pen Case ($30). Prismacolor Kneaded Rubber Eraser ($1). Caran D'Ache Pen ($23). Delfonics Ballpoint Pen ($10). Caran D'Ache Metal Mechanical Pencil ($18). Craft Design Technology Mechanical Drafting Pencil ($34). This edition of Garb is sponsored by our friends at Warby Parker. Brighten up the airport lounge with a little apricot this trip. Ernest Alexander Smith Charcoal Blue Denim Shirt ($155). Ernest Alexander Bedford Chocolate Wax Overnight Bag ($465). Ernest Alexander Tucker Orange Wax Shave Kit ($95). Ernest Alexander Dean Chocolate Wax Flask Set ($50). Ernest Alexander Thomas Pocket Square ($30). Nike Flyknit Lunar1 Shoes ($210). Unis Gio Pants ($198). Barbour Quilted Leather Gloves ($80). Junkers Bauhaus Watch ($385). Travelteq Card Holder ($160). This edition of Garb is sponsored by our friends at Ernest Alexander. 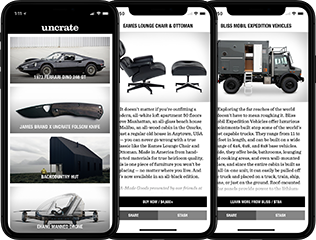 Enjoy 20% off any purchase by using code UNCRATE at checkout. Whether you're hunting the Kraken or Nessy, a little rum may just give you the edge you need. Kraken Black Spiced Rum ($20). Kraken Rum Book ($14). Kraken Rum Moleskine Notebook ($13). Kraken Rum Glass Combo Set ($20). Black Sheep Irish Fisherman's Sweater ($109). Battenwear Travel Shell Parka ($706). Tretorn Gunnar Boots ($85). Burgus Plus Ultimate Selvedge Jeans ($216). Ultimate Carabiner Compass Watch ($79). 200' Sterling Rope ($130). 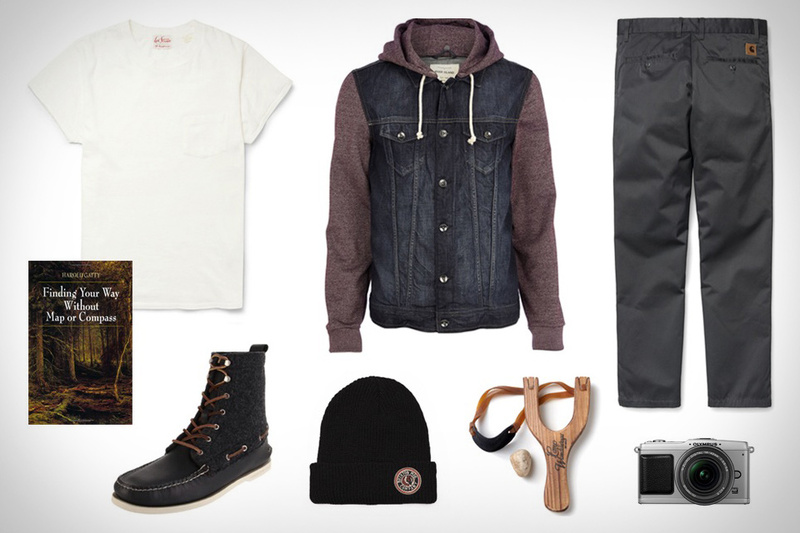 This edition of Garb is sponsored by our friends at Kraken Rum.